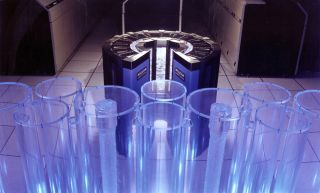 The Cray-2 suppercomputer was made by Cray Research beginning in 1985. For a time, it held the title of world’s fastest computing machine. The CRAY-2 had more memory than several hundred PCs and an aggregate speed of more than 1,000 personal computers. In this historical photo from the U.S. space agency, the Cray 2 for the Numerical Aerodynamic Simulator is seen glowing at the NASA Ames Research Center in Mountain View, California, on Jan. 1, 1987.